Arranged by Howard Cable. Percussion by Robin Engelman. This is a medley of the official songs of the service branches of the United States Military, including the Army, Navy, Air Force, Coast Guard and Marines. Part of the Canadian Brass Ensemble Series, it is scored for standard brass quintet with first trumpet doubling on piccolo and the addition of percussion (snare drum, cymbals, bass drum). The percussion parts are optional. The arrangement is by Howard Cable who was a conductor, arranger, music director, composer, and radio/television producer in Canada. He has penned more than 60 arrangements for the Canadian Brass. This is playable by an undergraduate level ensemble, but one that should include a good piccolo trumpeter. Score and parts are beautifully printed. 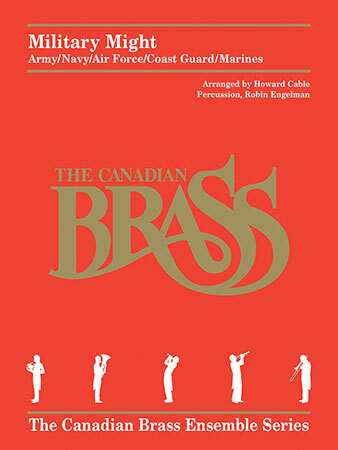 It has been recorded by the Canadian Brass and can also be accessed on YouTube.